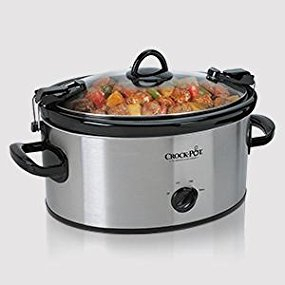 Can I Substitute a Dutch Oven for a Crock Pot or Slow Cooker? Dutch oven vs Slow cooker – Which should I buy? How many amps does a slow cooker use? Slow cooker temperature – What are they? Can slow cooker be used instead of dutch oven? What is the oven temperature equivalent of a slow cooker? Can I use my oven as a slow cooker? How many watts does a slow cooker use? Are slow cookers cheaper to run than ovens? Is it safe to leave a Crock Pot on high unattended? Can slow cookers catch fire? What temp is warm on a slow cooker? I often get asked this question. Normally one of my readers is looking to make a new purchase…invest in a new Dutch oven or give a slow cooker a chance. Lets consider the slow cooker vs dutch oven question. Of course, they are not mutually exclusive…you are allowed to have both! I do and they serve a purpose depending on different scenarios….more on this later. Let me just cover a few points first before I go into more detail. These are very general statements that I believe to be true based on my experience. I use both…but as you can guess, I prefer my Dutch oven. Before I go further, let me clarify what they are and how they might be used. If you already know, feel free to skip this section. They are counter top electric pots that cook at low temperatures…hence the slow cooker name. It takes a long time to cook which is actually an advantage. You can actually cook a wide variety of dishes in a slow cooker. You can cook tougher cuts of meat which are great when slow cooked. Power outages or unreliable supply can cause major issues. Dutch ovens have been around for hundreds of years and they were essentially designed for one pot cooking. The Pennsylvanian Dutch folk used them while travelling as it meant that they didn’t need to carry lots of equipment. The tradition of one pot cooking is still going strong and is a staple in lots of households. Essentially, they are lidded pots cast from iron. They have tight fitting lids and are very flexible. You can use them on the stove or in the oven. Household versions are essentially enameled, a process designed by the leaders in enamel Dutch ovens, Le Creuset. Outdoor dutch ovens are popular with campers and those pans are seasoned instead of enameled. In some ways they do similar things but essentially, they are quite different. There are a number of reasons why you would choose a slow cooker over a Dutch oven. One of the major reasons is cost. A basic slow cooker is relatively cheap to buy whereas a decent Dutch oven can be relatively expensive depending on the size. The other aspect to consider is the cooking cost. I will look at this in more detail further down but essentially, the cooking cost is a fraction of the cost of cooking in a conventional oven. Another reason why it suits so many people is the convenience factor. Simply placing all the recipes into the slow cooker in the morning and arriving home later to a hot meal is fantastic…especially for busy households. Added to this, people a generally more comfortable letting a slow cooker cook at home while the home is empty. The worst that can happen is that it blows a fuse. Generally, people are not comfortable leaving an oven on while they are out for most the day. Slow cookers are also considered lower maintenance. You can put the ceramic dish into the dishwasher whereas you cannot do the same with a Dutch oven. The biggest advantage is the sheer flexibility of a Dutch oven. You can pretty much do most kitchen tasks in one pot. Moving freely from the stove to the oven, you can bake, fry, sauté, braise…you name it, it can be done. This is what makes Dutch ovens marvelous and so invaluable in a kitchen. The slow cooker is limited in comparison to specific recipes and tasks. Having cooked for many years…including professionally, I have to say that if you cooked the same recipes using both these mediums, the Dutch oven recipe will taste better. This applies to almost all recipes…however, that is not to say the Slow cooker cooks badly, it doesn’t. Its just that the Dutch oven does a better job. This may be a benefit to some…not to others. You can cook in half the time with a Dutch oven. This is great if you don’t want to cook all day long…not so great if it means you have to return home or ‘babysit’ your dish. Another advantage is the retention of nutrients. Slow cookers can remove so many of the nutrients in foods through their cooking process. This means that it may still taste good, but the health qualities are removed. Dutch ovens do not suffer from this as much. There are ways around this, mainly through sauteing food before you cook them. Even still, the Dutch oven fares better. Over the long term, a Dutch oven can prove to be great value. Firstly, the sheer number of tasks you can complete in them. Secondly, they can last decades is cared for properly. In comparison, a Slow cooker will have a limited shelf life in most cases. Yes, you can. Essentially, the slow cooker was invented on the basis of the Dutch oven. The idea being that it saved cooks having to heat the oven. They both braise food slowly with a low heat. Therefore, you will find that many of the recipes can be adapted very easily to fit the Slow cooker…and vice versa. The biggest issue people have is the temperature. Slow cookers generally only have a high and low setting. They vary by brand but in the main, they are between 170 – 190 Fahrenheit. The conversion, I will discuss in more detail below but essentially, a dutch oven takes roughly 25% of the time of a slow cooker. Most meat dishes should be slow cooked in a Dutch oven for the best result. At a heat of 225F, most dishes take between 3.5 – 4 hours. Ideally, you should consider getting both. You can do so without having to spend a fortune. You will introduce a lot more flexibility and options to your kitchen. Converting recipes is not the headache you might imagine. As I stated above, they operate with a similar process…low and slow heat over a period of time. Using less liquid is recommended when converting Dutch oven recipes for the slow cooker. This is because the moisture is sealed in a slow cooker which means no evaporation. Recipes for Dutch ovens account for some moisture loss. You also need to account for the fact that food could be cooking all day in a slow cooker. This means that if you chop your food into small pieces, there is a real danger that it will overcook and degenerate. You can bet against this happening by using larger chunks of food that take longer to cook. Selecting the right temperature on a slow cooker is also important. Often you have a choice of low or high. The general rule is based on 300F. If the Dutch oven recipe calls for a recipe over 300F, go for the high setting. Obviously, if lower than 300F, use the low setting on your slow cooker. Another tip that helps when converting Dutch oven recipes involves using the stove. Often you will find that slow cooked food lacks a little flavor. You can remedy this by searing the meat to capture the flavor. Do the same with your vegetables too and you will get a better result guaranteed. Finally, consider adding some ingredients at a later stage in the slow cooking process. This might not suit everybody since they may not be home to do so. If you do have the chance to do so, it can make a real difference. Some vegetables can end up a mess when they are overcooked, if the Dutch oven recipe tells you to add them later, try to do so too when converting the recipe. Hopefully, adding these tips to your recipe will help you transition the recipe successfully. The general rule is that a Dutch oven at 325F takes 25% of the time that a slow cooker would. So, to make it clear, if a recipe takes twelve hours in a slow cooker, it will take three in a Dutch oven. This conversion is based on the low setting of your slow cooker. If your slow cooker is on the high setting, it will take 100% longer than a Dutch oven would. So, going back to the example, if the Dutch oven recipe takes 3 hours, it will take 6 hours in your slow cooker on a high setting. What you buy should depend on a number of factors. I will preface the following by saying that they are both worthy of your money. Essentially, they get to the same result but in different ways. I would suggest that both have a place in your kitchen…in fact, I would recommend that you find a place in your kitchen for both. How do you want to cook your meals? If you prefer to return from work and cook your meal there and then, then a Dutch oven is your only viable option. Slow cookers are exactly that…slow. If you want to return home to a hot meal, then a slow cooker on the go while you are at work may be the best option for you. It is worth scrolling back up this page to revisit the advantages and disadvantages of Dutch ovens and slow cookers. In my experience, if you made the same recipe in a Dutch oven and a slow cooker, the Dutch ovens results taste better. They tend to be thicker and they have a greater depth and layers of flavor. This is because the cooking process of a Dutch oven often means that flavors are sealed in on the stove before being moved to the oven. You can of course braise and sauté food before you place them in a slow cooker but that kind off defeats the purpose. One thing is for sure, doing this makes the food taste so much better. I make no secret of the fact that the Dutch oven is my favorite dish…you can pretty much do everything in them. They are absolutely the most versatile dish in my kitchen. The question is whether you need that versatility…you may well have plenty of other options in your kitchen. I do have to say that on some more premium slow cooker versions, you can use them on the stove but generally, they are pretty limited. Slow cookers are relatively cheap to buy and it appears you are getting much more bang for your bucks. However, they do have a range of price options and some of the premium ones are quite advanced. 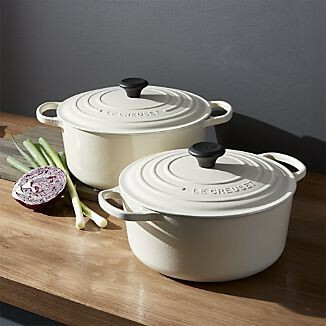 A premium Dutch oven around 6 quarts, such as Le Creuset Signature will cost you over $250. However, you can cheaper ones at around $60 such as the Lodge enameled cast iron Dutch oven. The key point is that if you look after them and treat them well, they can last a long time…even decades. 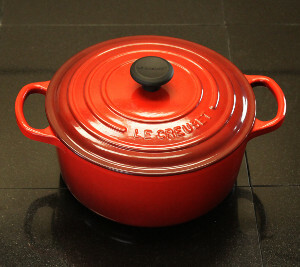 In fact, some used Le Creuset dutch ovens are collectors’ items and seen as an investment. This is subjective as most people I know keep their Dutch ovens on show. They are proud of them. They actually bring a design flavor to the kitchen and are often sold with very colorful colors. They are a statement piece. If you are planning to put them away, do so in a dry place as you don’t want the cast iron to start rusting in a humid environment. The same cannot be said for Slow cookers. Generally, they are quite unattractive pieces of equipment. Mine stays in my cupboard most of the time. It’s better there. The question you should ask is whether you have the storage space or are you prepared to leave it on show. In summary, the slow cooker is the most efficient of the two. This we already know. The question is how much more cost efficient is it? According to research, the slow cooker uses slightly more energy than a light bulb. It is approximated that a slow cooker uses 0.7kWh over an eight-hour period. An average conventional oven uses approximately 2kWh per hour. The cost of electricity is approximately 12 cents per kWh. Since an average stew takes three hours, we can say that the cost of the oven is 72 cents in total. Since the slow cooker will take about 8 hours, the cost will be approximately 6 cents. You can therefore see the significant saving in electricity. Slow cookers range from 0.5 amps to 2 using 120 volts AC. Depending on the setting that you use, the low setting uses 70 watts and the high temperature uses 250 watts. As we discussed above, the general rule is that the Dutch oven takes 25% of the time of a slow cooker. See above for more details but essentially, if you are converting recipes or even just planning your meal, keep that in mind. In many cases, slow cookers have two heat setting…low and high. The Low setting is approximately 200F whereas the high temperature is approximately 300F. If you want another way of looking at it, an hour on the high temperature is approximately two and a half hours on the low temperature. Yes, a slow cooker can be used instead of a Dutch oven. There are a couple of things you need to consider. Firstly, the cooking time will greatly increase from the Dutch oven recipe. The Dutch oven recipe is a quarter of the time it will take in a slow cooker. Scroll up the page to look at recipe conversion, but you also need to make sure that you don’t overcook certain foods. When considering the recipe, look at each ingredient and ask yourself whether it is appropriate to have that cooking for eight hours. It is completely possible to slow cook without actually having a slow cooker. The key here is having an oven where you can regulate the temperature. The best kitchenware to use is a Dutch oven as it retains and delivers heat consistently. However, you can pretty much use anything as long as it can go in the oven. The key question is whether you are prepared to leave the oven on for that long. At these low temperatures, it can take up to 8 hours to cook. Therefore, it really does depend on whether you are prepared to leave the oven on. As you have read, there is a time and a place for both slow cookers and Dutch ovens. In most cases, it is not a slow cooker vs Dutch oven debate…in an ideal world, you should consider owning both. If you are opting for the slow cooker, you can adapt many Dutch oven recipes but do so with care. Use your common sense when it comes to ingredients. 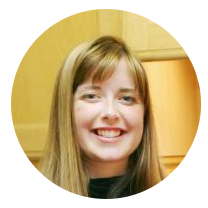 Make sure you have taken in and understood the information above, it will prove invaluable. What have you decided to do? Leave a comment below! In most circumstances, slow cookers have a high and low setting. Although the temperature varies by brand, it is approximately between 170 – 190 Fahrenheit. It is always worth checking the manufacturers guide for a clearer figure. Yes, you can as most ovens allow you to control the temperature. You can cook at a very low heat in most vessels. Dutch ovens are best as they distribute the heat very evenly. It is safe to leave your slow cooker on all day as that is what they are designed to do. That is assuming that it has not been damaged in any way. 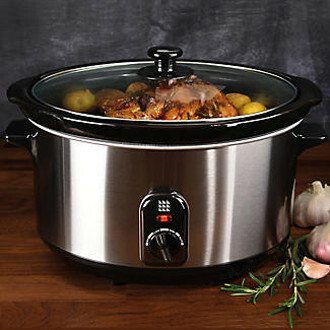 On average, a slow cooker uses 0.7kWh over an eight-hour period. Yes, they are much cheaper to run. Often it is a tenth of the cost if you compare it to an oven running for 3 hours. That is what they are designed for so I wouldn’t worry. If it has not been damaged in anyway and you follow all the manufacturers instructions, there should be no issues. Every electric item has the potential to catch fire. However, Crock pots and slow cookers are designed to run for long periods of time so it is not something that should cause you concern. As long as the item is not damaged, you should be fine. 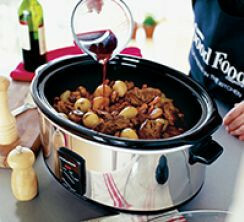 If your slow cooker has a warm setting, it normally operates at between 145 – 165 F. In Celsius, 62 – 74 degrees.